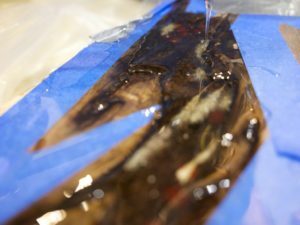 You’re probably asking, “What’s the big deal with resin anyways?” We’re here to explain. 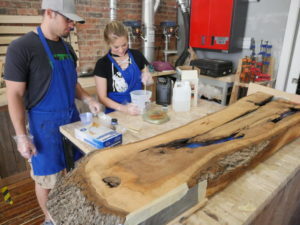 Using resin in woodworking is great to add interest, color, and surprisingly enough – sturdiness to your wood project. 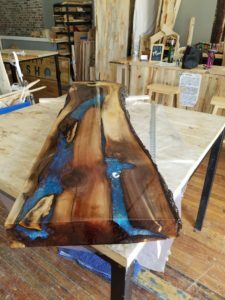 There is an infinite amount of ways to combine resin with woodworking, so we will just show you a few of our favorite projects made at I Made It Workshop. In this project, they decided to add bits of leaves and berries floating in the resin. 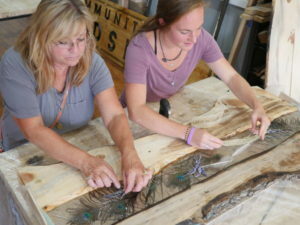 It adds an extra element of nature and woods to the piece. We’ve also had pieces where people added coins, small toys, and even a mini-figurine! 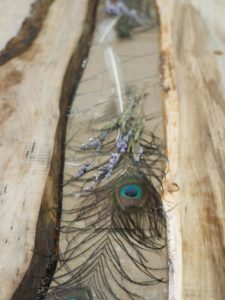 Here they added peacock feathers and bits of lavender in between a piece of pine and walnut to create a desktop. 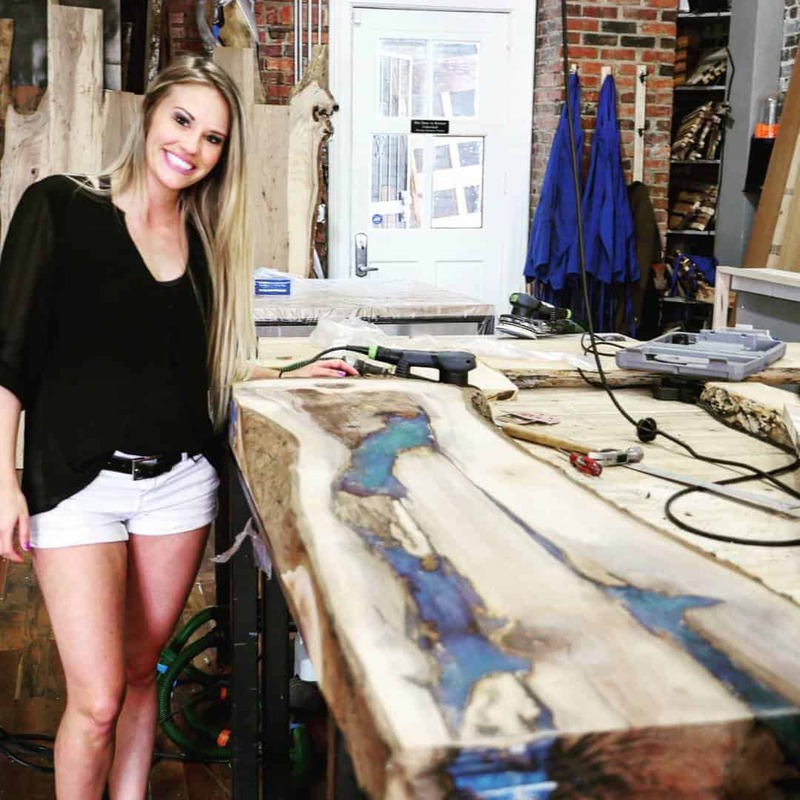 For this project, Sarah wanted to put blue colored resin into the cracks of her slab of walnut. 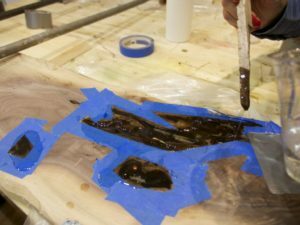 To do this she got blue powder and a silver powder to mix into the clear epoxy. 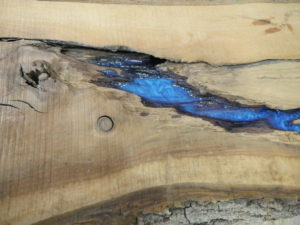 The effect is a bright luminescent color in your wood! Here’s a video of the pour being done! Sarah then did a final clear pour over on the entire project to give it a glassy effect! 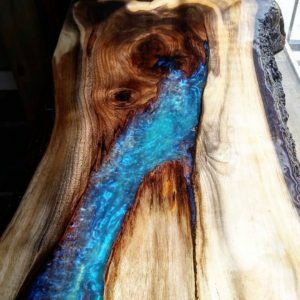 If you want help in creating your very own resin piece for your home, I Made It can help with every step of the process! Let us know in the comments what your favorite piece is or what you would want to make!